It's no secret that video game manufacturers are making mountains of money. Playing arcade games is among the most popular forms of entertainment today. Thinking of millions of people pumping billions of quarters into video games prompted me to wonder what the game manufacturers have done for the players. Picture yourself entering your local arcade and sidling up to your favorite game. You dig deep into your pockets, fish around, ignoring the lint, and finally draw forth a quarter. To insert the coin, you must bend down and hunch over. Is this really inconvenient? Sure it is. But wait, there are more inconveniences and distractions you probably overlook every time you play. What about glare, small joysticks, cigarette-scarred faceplates, and inaudible sound effects? When you get right down to it, you are the client of the video game manufacturer. You are renting his machine for a period of time. If you were renting a car, would you be satisfied if the seat wasn't adjustable? Or if there was no ashtray? What if you couldn't see out the windshield without sitting on a phone book? And what if there was, God forbid, only an AM radio? Unless you are a true glutton for punishment, I doubt you would return to that car rental agency. Why then, do arcade game players continue to play poorly designed games? I don't know. I think something should be done about it. This article is my contribution to the cause. If I were pressed to choose coin-op games at opposite ends of the player-friendliness spectrum, they would be Tron and Phoenix. Tron has, without a doubt, the most innovative cabinet design I have seen in a long time. The people at Midway obviously spent a great deal of time and effort to make their game unique. Centuri designers, it appears, were charged only with creating a functional console. "Functional" is the kindest word I can think of to describe the cabinet of the Phoenix machines. The control board is placed at a strange angle that forces players to bend over just to play. In addition, the place to which your palms fall most naturally is covered with a sharp edge. Why can't the manufacturers be nice to us--the source of their bread and butter, not to mention their Porsches and swimming pools? The advantages of producing a "friendly" machine would be many. First, if a machine is easy to put quarters in and the controls are comfortable, players will be inclined to play longer. The second, and perhaps the most important advantage, is that players will respect a game manufacturer who recognizes his customers as humans. If players feel respected and cared about, a more harmonious relationship will evolve between the manufacturer and his customers. The most significant aspects of my dream machine are explained below. I have attacked every problem and inconvenience that I encounter while playing video games. If you have any further suggestions, please drop me a line, I'd like to confirm my conjecture that most people have pet-peeves when it comes to video games. To eliminate the bending and hunching to insert your quarter, I would place coin slots at the side of the control panel. In addition to quarters, the machine would accept nickels and dimes. Many arcades are not equipped with machines that change other coins into quarters, and this would allow people to spend all of their change. One problem I have found on many arcade games is that the coin return box is too small--so small in fact, that even little kids have quite a time getting their money out. The reason the manufacturers did this was to prevent people from flinging coins up the return slots and triggering the credit mechanism, but I think the design could be improved. The coin return box should be placed in a logical, visible spot. It should be large enough for at least three fingers to be inserted. Although this would do nothing for the players, the arcade operators would appreciate large coin boxes. There would be one large drawer which could be opened, and inside the operator would find three removable plastic jugs. Each jug would contain only one denomination of currency. There are jugs like this in the upright Eliminator cabinets from Sega/Gremlin. Once you had inserted enough coins for a game, the credit counters would automatically advance by one. There would be a continuous counter on the video screen itself and another display mounted on the headboard. The overhead counter would be a courtesy to other players who might want to know if you have already pumped a roll of quarters into the machine. Instead of waiting around wondering whether this was your last game, they could easily see how many games you had left. Although many games today have joysticks, most suffer from the same problem: they aren't easy to handle. The joysticks found on both Gorf and Tron are the nicest I have seen. My machine would have a large joystick, similar to that found on Robotron. The main difference between my joystick and the others on the market would be that the top part would be made of a soft, yet durable rubber compound. Many players get blisters and callouses from extended play periods; my joystick would put an end to that. As a courtesy to south-paws, my machine would be equipped with two sets of controls; one for right-handed people, and one for lefties. As far as I know, the first coin-op machine to implement this was Berzerk. Many faceplates are destroyed by cigarette burns. I would have a stainless steel ashtray built right into the machine. This would encourage players to place their cigarettes in the tray, rather than propping them between two buttons. The tray would be easy for the operator to remove and empty. Glare is the bane of all arcade game players. A perfectly good game may be made unplayable simply by its positioning. I can think of three things that, when combined, should practically eliminate glare. First, the cabinet headboard should be large and overhanging. Second, the monitor should be almost vertical. Third, non-glare plexiglass should be used over the screen. In addition to the video, the audio on my machine would also be greatly improved. Sound effects would be in stereo and would come from speakers located at ear level. Too many games have the speaker located near your knee caps. On the sides of the headboard would be slotted quarter holders where people could place their money. Arcade etiquette says that when you place a coin on a machine, you get the use of the game when the current player is finished. So the current player would not be annoyed by kids reaching in front of him to "put their quarters up," these slots would be out of the way. They would also be tilted so that the quarters would not come raining down on the player if the machine was bumped. 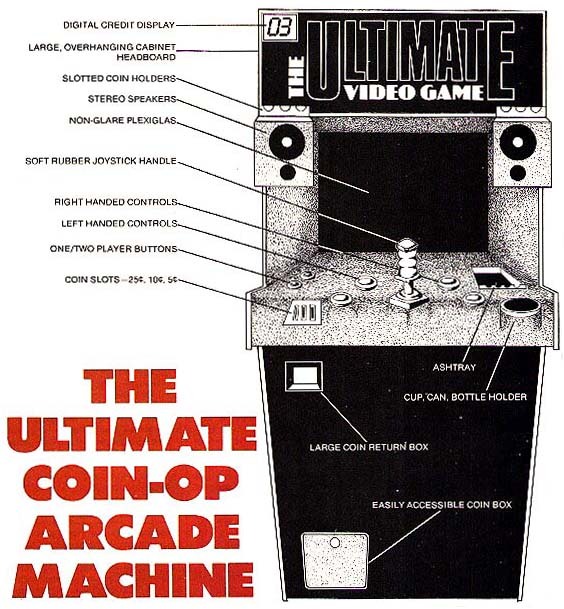 There you have it: a design for a perfect arcade machine. Now all we have to do is find a manufacturer. Is anybody listening?